The Alexandrine Parakeets, although they are medium sized birds, are among the largest parakeet species. Many Alexandrines reach a length of up to 25 inches, although much of this length is accounted for by their long, elegant tail feathers. They have a slender build for a parrot, which is typical of the Asiatic Parakeets, but even so are slightly more stocky than other Asiatics such as Indian Ringneck Parakeets. Healthy pet Alexandrine Parakeets, when properly cared for, can live for up to 40 years in captivity. Because of this long-term commitment, it is extremely important for potential owners to make sure that they have the time and resources to care for one of these birds before bringing one home. Tame, handfed Alexandrine Parakeets can make loving and affectionate pets, although it has been noted that they have a tendency to become "one-person" birds, strongly bonding to their favorite family member while shunning others within the household. 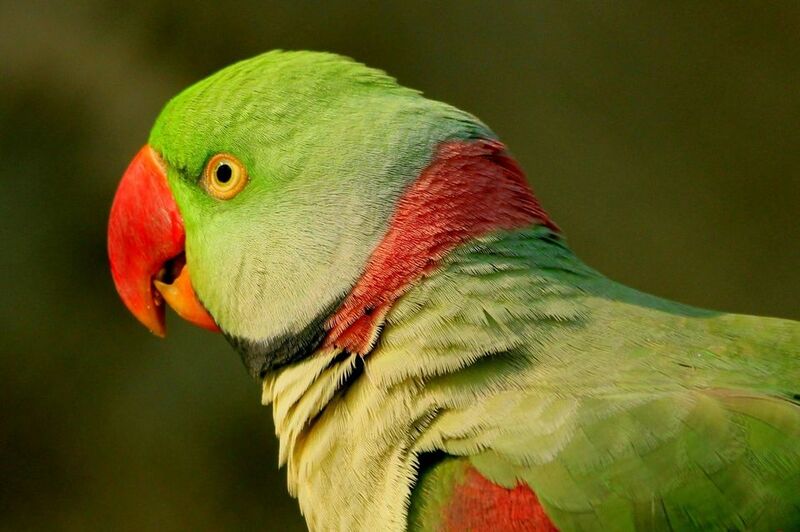 Like other asiatic parakeets, many Alexandrine Parakeets go through a hormonal bluffing phase during adolescence, which can be difficult for less seasoned bird owners to handle. However, with proper socialization and the use of bonding techniques, Alexandrine Parakeets settle nicely into pet situations and thoroughly enjoy interacting with their owners. These birds are highly intelligent and are known to be excellent talkers, making them very popular pets. Alexandrine Parakeets, like many asiatic parrots, are a dimorphic bird species. Adult males display various hues of green all over their bodies, with a black and rose colored ring around their necks. Females of the species display the same coloring, without the neck rings. Both males and females have a deep rose colored patch at the tops of their wings. Like all parrot species, balanced nutrition is very important for pet Alexandrine Parakeets. Most pet Alexandrine Parakeets do well on a diet consisting of fresh vegetables, leafy greens, grains, some healthy seed, tree nuts and a high quality commercially made formulated pelleted diet. Fresh vegetables are the cornerstone of a good diet for parrots. Alexandrine Parakeets are very active birds, and they need plenty of exercise to maintain their physical and emotional health. A large flight cage is preferable for these birds -- they need plenty of space to be able to move around without damaging their long, beautiful tail feathers. A pet Alexandrine Parakeet should be allowed a minimum of 3 to 4 hours a day to stretch, play and exercise outside of its cage. This playtime should always be supervised in a safe, "bird-proof" area, as Alexandrines are very curious and can get into trouble if left to their own devices. Owners of Alexandrine Parakeets recommend that they be provided with plenty of safe toys to play with and chew on. These intelligent birds get bored quickly, and if they tire of their own playthings, they will readily make their own toys out of your belongings, which can be hazardous to both the bird and your keepsakes! Known for their beauty, intelligence, and excellent talking abilities, Alexandrine Parakeets have been popular as pets for centuries. Once reserved as pets for nobility and the elite, these birds are highly regarded by many as some of the best pet parrots available. Alexandine Parakeets can be quite noisy and loud, so they are probably not a good choice for those who live in close proximity to neighbors. Their powerful voices can carry for quite a distance, so it can be challenging to keep one in an apartment or condominium setting. In addition, they need a far amount of space for their large cage, and for a safe play area. It is recommended that potential owners assess their current living situation closely in this regard before adopting an Alexandrine Parakeet and bringing one home. If you think that an Alexandrine Parakeet might be the right bird for you, be sure to do as much research on the species as possible before "taking the plunge." Contact local adoption and rescue organizations to see if there is one that might be for you and spend some time with them and their birds. Observe how the birds interact with their caregivers and other family members. Taking time to make sure that this species is a good fit for you can make the difference between a good or bad companion experience, so take care not to rush into anything! If, in the end, you find that an Alexandrine is right for you, you'll be rewarded with a beautiful, intelligent, and loyal bird that will be glad to be your companion for many happy years.